Goodreads: Estranged from her family since just after World War II, Mary Browning has spent her entire adult life hiding from her past. Now eighty-seven years old and a widow, she is still haunted by secrets and fading memories of the family she left behind. Her one outlet is the writing group she’s presided over for a decade, though she’s never written a word herself. When a new member walks in—a fifteen-year-old girl who reminds her so much of her beloved sister Sarah—Mary is certain fate delivered Elyse Strickler to her for a reason. Kritters Thoughts: Two stories are woven together in such a great way - through the writing of a memoir. Mary Browning is in her later years and has been a member of a writing group filled with other folks around her age and in walks a teenager who will help Mary discover some truths. Elyse is the teenager that enters her world and she has some dramas of her own - her parents are separating after a battle with cancer and her grandmother is in ailing health, so Mary will be able to help Elyse just as much as she is helping her. I am not sure if I would say if this is extremely dual narrative - but it felt like it and I liked it. I liked how Mary's story told through short stories also fit into the bigger story of having Elyse help her write her memoir it made the book feel natural and the two storylines weren't forced together. I don't think I knew much about the female flight program during the war and I loved reading the stories of how they were able to qualify and then how the program worked. My favorite thing about historical fiction books is learning something without feeling like I am reading a textbook or doing research. The other thing that I loved and learned was the aspect of how Jewish people living in America felt as World War II was affecting their family and friends overseas. I think most of the books I read during this time period that focus on Jewish folk do not take place in the States. It was interesting to read how the sentiment of the Germans was bleeding over to Americans and how getting into college could be difficult due to a last name. 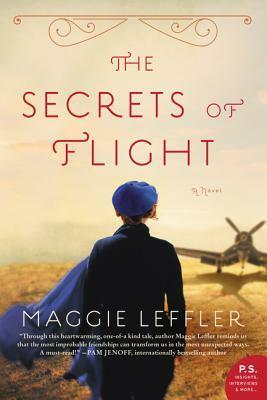 This is my first Maggie Leffler book and I am excited to see what she comes out with next. Disclosure of Material Connection: I received one copy of this book free of charge from TLC Books Tours. I was not required to write a positive review in exchange for receipt of the book; rather, the opinions expressed in this review are my own. I have tried to track this one down and failed! sounds very good. I'm glad you enjoyed this one and will be looking for more from this author!